You know how Planting A Future started out, right? Supplying fruit trees to vulnerable households and institutions? We still do that. Just recently Lloyd went on a little tour to Singwamba Primary School and Singwamba Clinic to deliver the donated trees. As you can imagine everyone was really excited and curious. So lots of people gathered at both spots when Lloyd showed up. Lloyd took the time to explain everything about the new trees: how to plant, how to take care of the seedlings, how and when to water them. 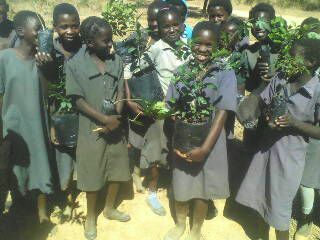 The kids at Singwamba Primary School got a free gardening lesson as well. Lloyd showed them how to choose a good spot for their school’s orchard and where to plant each tree to benefit best. He also explained how to plan and do the digging and planting. So after theoretical knowledge was gained it was all about getting the hands dirty and plant and water the little trees. Each and everyone helped, full of enthusiasm. 🙂 Those little guys can’t wait to have juicy and yummy fruits for lunch! A good spot for the new orchard? But also the Singwamba Clinic recieved some seedlings. Especially for a clinic it is important to offer nutritious food to the patients. Malnutrition very often affects sick people even worse than healthy ones because the side effects of medication worsen too. Lloyd helped the clinic’s staff to plant the trees and explained all about them. He put extra focus on the moringa seedlings because, as you might know, this superfood is used to treat so many diseases is very nutritious. 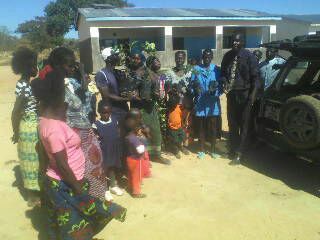 So Lloyd talked a lot to the women at Singwamba Clinic to explain and educate about the importance and use of Moringa as food and medicine. Especially for the maternity wing it was a very interesting day. As you guy know our friends from Repairer Of The Breach sponsored our PAF xmas party. Lloyd just sent us a little report. Enjoy your read and merry xmas again! “Christmas is a time of sharing. Family members and friends gather from far and wide to celebrate and reunite. We in Chinkonono village were not left out of the festivities. Just like others around the world we gathered together to eat, sing and pray. It was indeed a wonderful time to see all members of the village assemble in the spirit of oneness. This special christmas was made possible by PAF and our partners from ROTB. They donated money earlier on already for sewing machines and fabrics gave PAF money to purchase food stuff for the event. From the funds we were able to buy three bags of rice, two bags of maize meal, a bag of flour, 10 goats, 10 chickens and also some snacks for children. raising fruit trees seedlings for homes, schools and clinics. providing tailoring skills to people through the PAF-ROTB tailoring project. encouraging the community through practical interventions and teach them new new ideas such as preserving fruits and vegetables by sun drying and solving problems like damming streams. It was also an oppportunity to foster love and understanding among community members. Love without borders and love your neighbour as you love yourself were the themes. A pastor from the SDA Church preached a sermon from the book of Nehemiah on service to others Nehemiah 13 vs 14, psalms 133 vs 1 on brotherhood. There was so much food that everyone ate to his or her full and even managed to carry some food to their homes. We also had two bags of rice and a bag of maize meal left. These were donated to four old widows living on their own. This was a big miracle for the village as nothing of its kind has ever happened. There was so much gratitude from the village to PAF and ROTB for feeding and bringing the village together. Lloyd just sent us a little Christmas message out of Chinkonono Village. Wesley was leading our PAF women choir. We all wish you guys a merry merry Christmas. Thank you all for what you have done for us to make this year so special and successful! You guys all rock! So let’s celebrate Christmas now and spend some time with our loved ones and families.